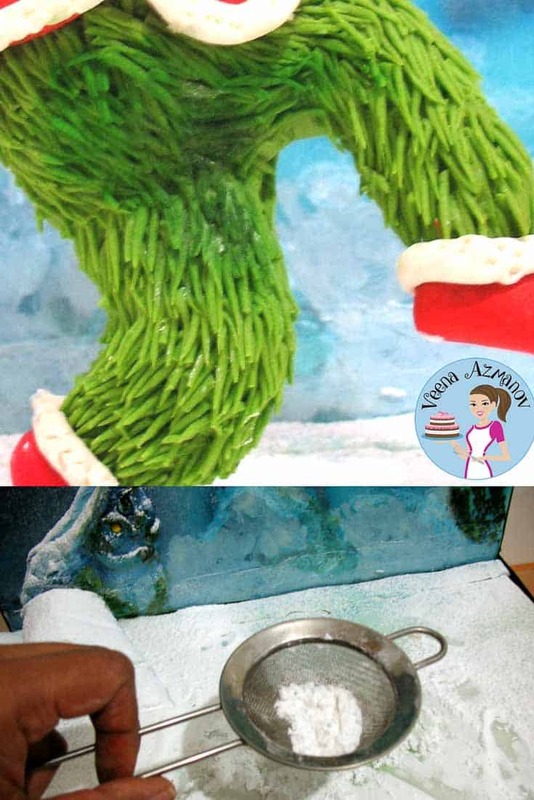 The Grinch sugar figure made in gumpaste is part of the Bake A Christmas Wish project collaboration with 80 plus other cake decorators from around the world. 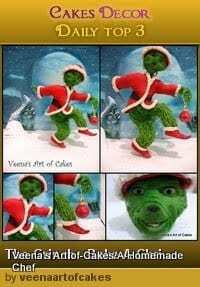 I choose to make Jam Careys The Grinch as my piece. 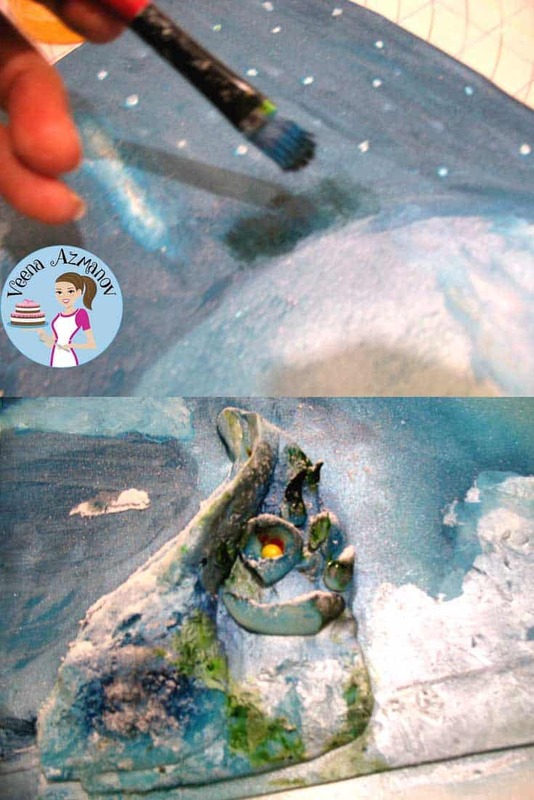 A bunch of 80 plus Cake decorators from all over the world go together and have been collaborating; each chose a movie theme to do in a decorative edible style to help raise money for http://www.make-a-wish.org.uk/ …. We each also gave tutorials that would sell and raise money for the foundation. 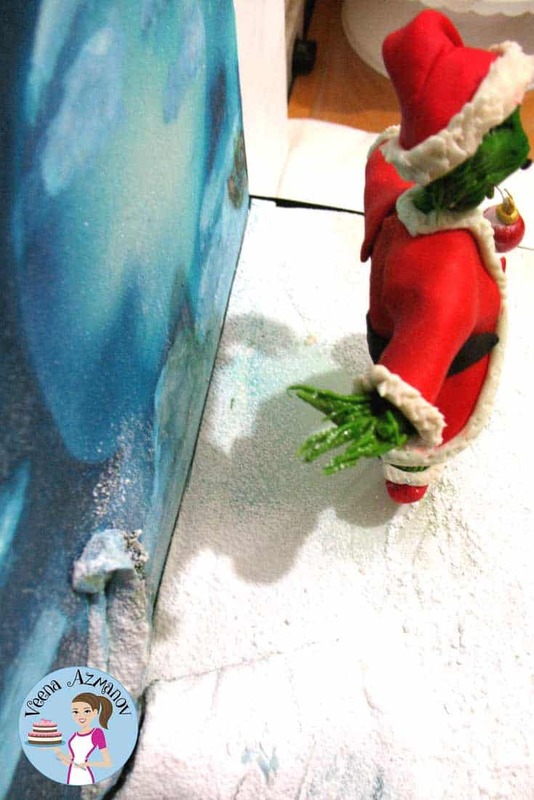 I chose to give my Christmas Poinsettia with Leaf Cutters and my Yellow Butter Cake recipe. 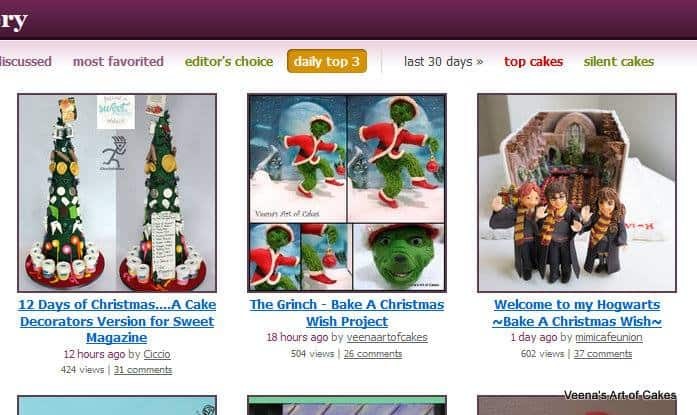 You can buy these tutorials at a bargain price on the Bake a Christmas Wish Facebook page or website at a bargain price. Each model is less than 5 Pounds and there are 6 different modules to choose from. 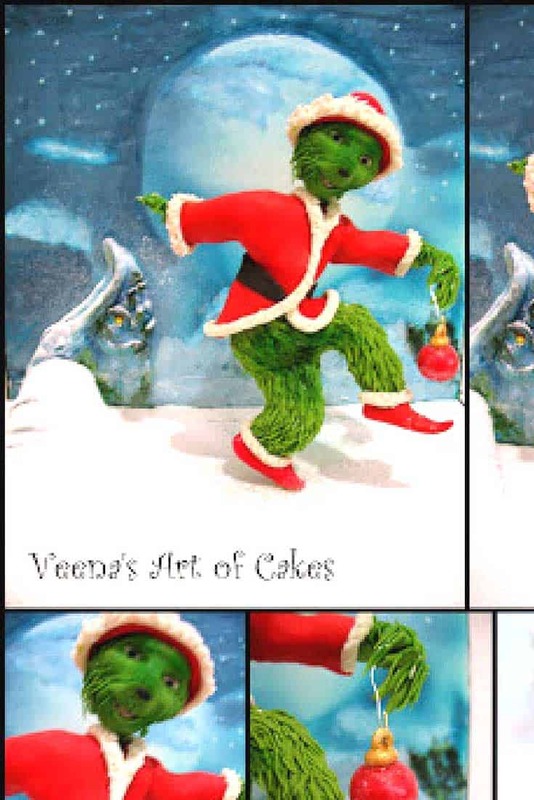 children’s book – How the Grinch Stole Christmas! Famous movie quote – One man’s toxic sludge is another man’s potpourri. This was my first collaboration project, and I was absolutely thrilled when I was asked to be a part of something so wonderful such as Christmas. Nothing means more to me at Christmas then charity, Christmas carols and movies. 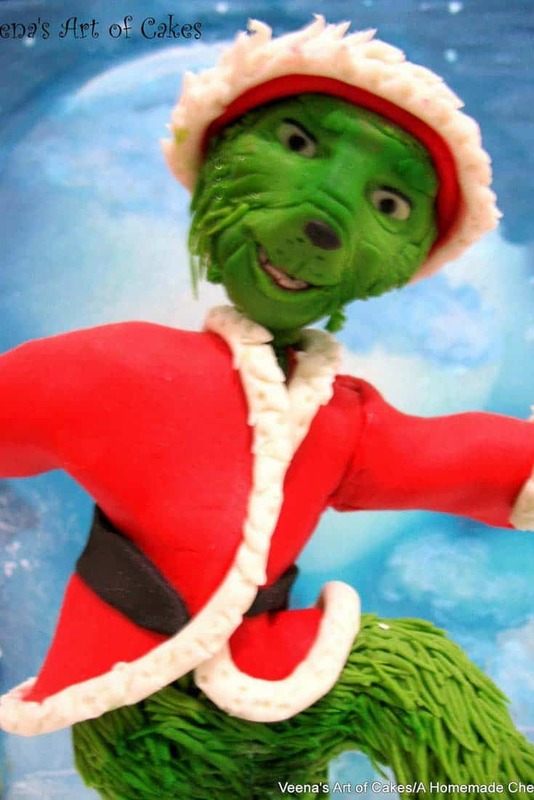 Our family favorite movie now is ‘The Grinch’. My husband and kids absolutely love the movie and never get tired of watching it over and over again. I wanted to try something I have never tried before so I chose this scene. Sculpting and hand painting are not my forte. I made an armature for the first time to do the figure. It took me a while to learn how to balance him on his toes and still look natural. I never made a cake with a backdrop before and so I choose to give that a try too. I donsome hand painted flowers but I never attempted such a scene before. Over all it was a great learning experience and a fun project that gave me an opportunity to expand my skills. It was fun to feel that I’m part of a team working on a common project. I thank each and every one who has been a part of this project and thank you who have purchased our tutorials for helping us with this charity. Here are some additional pictures along with some work in progress pictures. I hand painted the back drop. 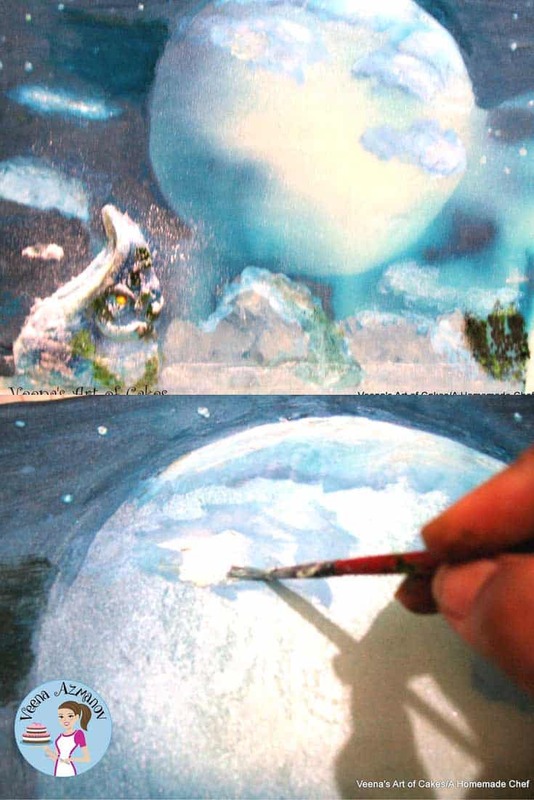 Shades of blue… Highlighted the white for the moon. Gave the mountain a 3D effect with the use of some Sugar paste. Mountain continued on to the base. The bauble in his hand was hand painted with red and gold. 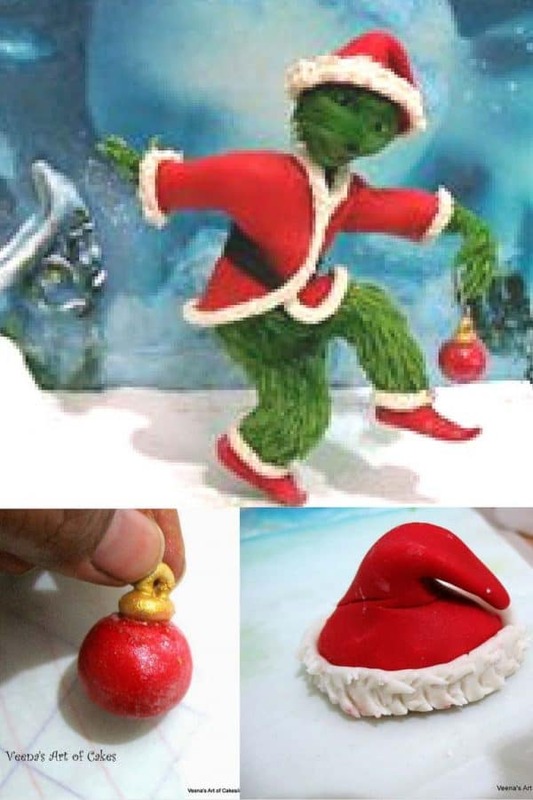 His Santa cap. Was quite difficult to achieve an ugly look for him. I kinda like clean and neat work so this as an effort. His fir is made individually, – Yes., I did sit and make each strand as I felt it was the only way to achieve that fir look he had. Some powder sugar for the snow. And placing him on to the front. I do hope you like him. 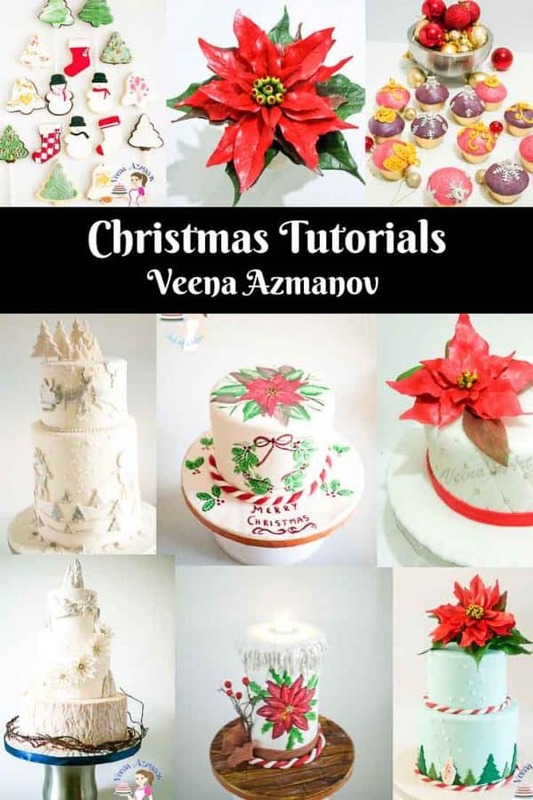 Please do consider buying the tutorials or even making a donation at this special time of Christmas. Thank you ! Happy to hear you enjoy my blog.